Tagged as: data, app, lib, tree. 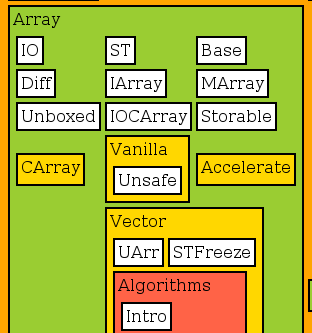 treemap-html is Haskell library and tools for construction foldable HTML tree view. To be honest the library doesn’t construct the real treemap with sizes of rectangles on the map based on some node weight parameters. It is only nested boxes tree view and package names are unfortunately misleading. On Linux use HackageDB as usually. 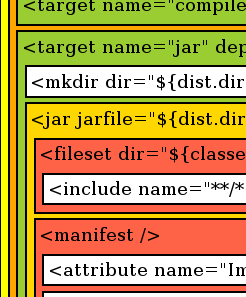 On MS Windows you can use also binaries, see dirmap.exe and xml2treemap.exe. Please be aware that it is an experimental throw away software. The function treeMap takes the Data.Tree with the String nodes and render it to the String with HTML elements. Creates tree view from the directory content. -n Integer  --name=Integer   maximum size of filename. than truncation. Creates tree view from the XML. 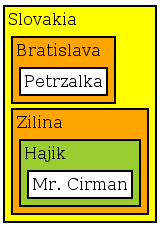 The boxes are unfolded with mouse click on their text labels.